271. 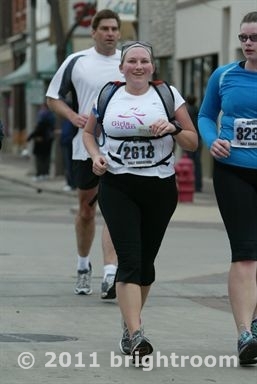 2011 WI Half Marathon or How I Absolutely Positively Did PR. Remember when I signed up for the WI Half Marathon simply because the finisher’s medal was shaped like a block of Swiss cheese? Well, as it turns out, that was one of the better decisions I’ve made in my racing life. Why’s that you ask? Well my friends, it’s because I PRed in a major way. This wasn’t a kinda-sorta- technical PR like the Ravenswood Run. This was a holy-crap!-I-just-blew-my-old-PR-right-out-of-the-frickin’-water PR! This was a probably-the-best-race-of-my-life PR! Back in November, my friend Sarah told me about the race, and we both signed up. A couple weeks before the race, I was starting to regret signing up. It was starting to feel like far more hassle than it was worth. See Kenosha, WI is close to home, but really, it’s not that close. It’s about a 2 hour drive from my house. Not a big deal, but with a 7:00am start time, that 2 hours meant a 4am wake-up call. It also meant potentially being quite stiff at the start of the race. Sarah and I tossed around the idea of getting a hotel room, but it seemed like an unnecessary expense since Kenosha wasn’t really that far. Packet pick-up was also turning into a bit of a nightmare. There were two Chicago area packet pick-ups neither of which was particularly convenient for me. The Wednesday night pick-up wasn’t an option since there was no way I could get home from work and out to the northwest suburbs before pick-up was over. I could get to the Saturday afternoon pick-up, but it would screw up the plans to work on the bathroom. Plus, pick-up couldn’t have been in a less convenient location. The location was a straight-shot north of my house, but there’s no direct route there. Ugh. The odds still didn’t seem to be in our favor though. The weather forecast was unpredictable at best: mid- 40s to 50s with chances of rain increasing throughout the day. It was chilly when we left the hotel wearing capris and long sleeves, but we couldn’t have asked for better race weather. It was cool, but sunny. I would guess somewhere around the low 50s. As someone who heats up (and sweats) a lot, it was definitely my ideal running temps. I was warm enough that I ended up taking off my jacket around mile 3 and running in just capris and my Girls on the Run Solemates (PS You can still donate to Girls on the Run until June 7th) t-shirt. The event was incredibly small – at least by Chicago standards – with less than 4,000 runners between the marathon and half marathon. It took us less than 2 minutes to cross the starting line from the back of the starting chute. The majority of the course was plenty big for the number of runners, as most of it was on the street, and the views were absolutely spectacular. We ran along the lakefront, through downtown Kenosha, and through a neighborhood full of gorgeous (and huge!) houses. Somewhere around Mile 1, it occurred to me that brining my camera along would have been a great idea. Oh well, c’est la vie. The course was full of beautiful scenery, but it was also full of curves and hills. It was definitely not the “very flat” course with “a few rolling hills” that I had in mind. Of course, I live in Chicago; my idea of a giant hill is running up a viaduct. Maybe it was very flat by WI standards. Honestly, I'm beginning to wonder if there's such a thing as a "flattering" race photo. Based on our individual trainings, Sarah and I decided to run together doing run/ walk intervals of 5 to 1 aiming to average a 12 minute mile pace. This was a wonderful plan of attack. I felt strong, confident, and just great over all. Things started to get rough around mile 12. 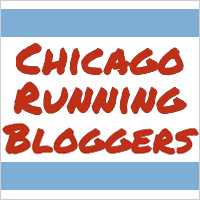 However, that was a marked improvement over the mile 7 breakdown at the Chicago Rock n Roll half marathon. Even though things started getting rough at mile 12 I still had my head in the game. My primary issue was the sudden need to poop. (Yeah, it happens.) There was a porta-potty and the final turn around, but we were doing so awesome I could not justify stopping! Despite the muscle fatigue, waning energy levels, and increasingly urgent need to use the bathroom, I managed to finish as strong as I’d run the rest of the race. Sarah and I even raced to the finish line to collect our awesome finisher’s medals! Oh, and I suppose you want to know my time huh? Sarah and I finished with an official time of 2:34:51. This is just over 25 minutes off my previous half marathon time! I guess that just goes to show that adequate (I wouldn’t go as far as to call it solid) training and perfect conditions really pay off! And that even things that seem pretty bleak can turn out fabulous. Oh yeah, and I can cross another item of my Mission 101 list. Sub 2:45 half marathon: done and done! SUPER proud of you and want to be best friends with mr. cheese man with legs (as I’ve already said). Also I think that’s a really good picture of you, so you are just crazy! Yeah, at second glance, it’s not really that terrible. I think if I weren’t wearing the CamelBak it would have been a much better picutre. Wow, girl! You did AMAZING!!!!! Nice job! Thanks so much! I had such a great race. I can’t believe what a night and day experience it was between this race and my first half! Congratulations on the PR! Being a Chicago resident, I ran this race last year and really enjoyed the size, weather and of course, the medal. I PR’d in it as well, despite the several mini-climbs that you can’t find in Chicago. Keep it up! I never saw this because I’m not good at reading peoples outside blogs, just got linked to it from your SP blog though!! I think this race was absolutely like best case scenario in every way. Knowing how “blah” of a training season I had and still PR-ing I feel confident that for my next half I can break the 2:30 mark!